Där Föddes En Längtan is the exclusive release by no other than Nachtzeit, the creative mind behind Swedish Lustre and so many other projects. With Där Föddes En Längtan Nachtzeit leaves lush atmospherics of Lustre behind and attaches his own (pseudo)name (the real person behind it all is Henrik Sunding) to something primal, primitive and undeniably Scandinavian black metal. 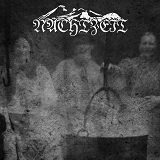 For the opening title track and En Nyckel Till En Dröm there are basically a pair of riffs that Nachzeit explores to their fullest. En Nyckel Till En Dröm, in fact, feels practically like the title track, almost the same riff, as if someone took a quick break to have a drink of water and returned to where he left off. Rapid, hidden, pushed into background pitter-patter percussion, the voice, which is more like a sound of iron sheet rustling in the wind, all wrapped around old Ulver or the first Kampfar record riffs. You get the picture – this is produced by an individual in touch with a Northern nature, minimum production and all. I Mörkret tends to be more assertive rather than fleeting. There is a subtle rhythm shift from pitter-patter to something rugged, the drum machine now getting a different command. It is just when you think angst and loss can't be overcome, the darkness gets squeezed a little harder, and actually there can be hope. Looking up the song title translation (I Mörkret means In the Dark in Swedish) does not quite assure my interpretation being correct, so feel free to have your mind roam and come up with your own explanation. With mini albums like Där Föddes En Längtan I sometimes wonder what comes first: the feeling and the mood which leads to generation of these repeating riffs OR the riffs are already made and need an outlet, thus giving birth to a quick piece of music. Proverbial chicken and egg. Only Nachtzeit knows the answer to this question, but meanwhile you can absorb Där Föddes En Längtan for what it is worth.